If 2018 is getting you down, all you need is a browser. I’m doing sit-ups for a demonic drill instructor who wants to get me in tip-top shape so I can join his military corps. A long time ago, this was one of several random events concocted as a way to deal with the multitude of bots that set up shop in Old School RuneScape, back when it was just plain RuneScape. They stopped being effective after a couple of months. 14 years after they ceased being useful, they persist. It’s a familiar story in a game that exists because players voted for its resurrection. 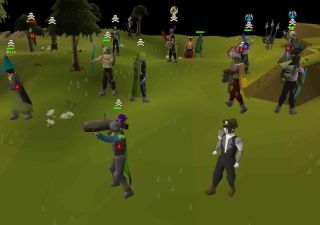 Old School RuneScape was originally created to be a copy of the game as it was in 2007—an exact replica designed to entice nostalgic adventurers. It’s not a snapshot of the universe as it was, however, as it’s still a living game with updates, additional quests and even a new continent appearing. It’s in a uniquely strange position, growing alongside its successor, RuneScape 3. The fundamentals, though, remain the same. When you leave the tutorial island, with its basic lessons on how to move, fight and level up your skills, you’re dropped in Lumbridge, outside a castle, and you just pick a direction. You might remember that there are rats in the kitchen cellar (of course there are), along with a quest from the Duke’s chef that will send you all over the surrounding area to find ingredients for a cake. These early quests go all the way back to 2001, when the very first iteration of RuneScape was born. Generally, Jagex creates content aimed at the average player level, so most of the low level quests were already considered old in 2007. They’re also the most completed quests in the game, being the first things new players come across, so it’s even more important that they match players’ memories of them. As I run around, hunting down flour and eggs, Ogilvie points out some goblins lurking behind a fence, menacing farmers. The little ne’er-do-wells are having a bit of trouble getting past the obstacle. They don’t look happy about it, but from where I’m standing, they can’t get near me. Maintaining the nostalgia often means leaving exploits and quirks and regrettable design choices alone, even if fixing them can easily be done. Even the menus have to be made out of existing sprites, while extra NPCs and buildings are often made from decade-old, and often older, assets. When it’s not the players ensuring that much of Old School RuneScape remains the same, it’s the tech. RuneScape was the kind of game you could play on a rubbish school computer between classes, on a browser. There was no worrying about if you could run it or not, or if you’d come back the next day to find it uninstalled. With two developers sitting either side of me, I’m not lacking guidance, but for everyone else Old School RuneScape eschews the kind of clear path through the game that modern MMOs typically favour. The mini-map reveals the location of quest-givers, while a journal collects important quest information, but nothing is spelled out. There are puzzles, mysteries and traps, evoking CRPGs and adventure games more than MMOs. It’s impossible to get stuck thanks to the decades of wikis and walkthroughs, but it can be a welcome reprieve from hours of grinding skills when you have to engage your brain. Rather than there being one big ol’ main quest, there are hundreds of vignettes and self-contained stories, and rarely do they devolve into straightforward fetch or kill quests. They might use their structure, but then they subvert or put a RuneScape twist on them. Quests are full of branching and optional dialogue choices, and it’s dialogue worth reading. That might be the most pleasant surprise about returning to the RuneScape of my teens and twenties: I wasn’t wrong, it really was very funny. It’s wry, with a penchant for parody, and it usually rewards chatty players will cracking punchlines and fourth-wall-breaking gags. It’s never been a game that takes itself very seriously. As we head to Varrock, a city famed for its large central street that players use to efficiently and quickly build up their fire making skill by making long rows of them, I spot a player wearing the fanciest of rainbow boots. They’re a reward, it turns out, for completing the Stronghold of Security, a very RuneScape way of handling account security. Essentially, it’s a dungeon that teaches you to not give out your password, and use better security. You answer questions given to you by magic doors until you get to the reward area, netting you a lovely pair of shoes. “Will Jagex block me from saying my password in-game?” one door asks, referencing an old scam where players would tell other players this obvious lie, inspiring them to type it into chat, letting everyone see it. Embarrassingly, a member of Jagex once fell for it. The tongue-in-cheek, sometimes wacky tone doesn’t mean everything can fit with RuneScape. It might have a holy grail quest involving King Arthur and pals—who talk about leaving England and taking a holiday in RuneScape—but Jagex also tries to ground its characters and flesh them out, rather than just using them for jokes and quests. Take Varrock’s star-crossed lovers—a pair of Shakespearean stand-ins—and their squabbling families. Their quest is a Romeo and Juliet parody, but these characters still have roots and backstories, while references to their history can be found elsewhere. They exist outside of their quests. There’s a religion, ritual sacrifices, a host of NPCs and a tricky solo boss battle. While none of this was around in 2007, because players know the land itself exists in RuneScape 3, it only makes sense that there’d be a swamp there in the past, in Old School. There are other nods that connect the eras, too. Chatting with the gnomes who live in the snake’s swamp, you’ll hear rumours about a gnome city, but you won’t be able to visit it. In RuneScape 3, that city is Arposandra, and it’s actually responsible for the swamp’s noxious fumes. None of this is to say that Jagex will never add an area told Old School unless it’s already in RuneScape 3. In 2016, the studio opened the doors to a brand-spanking-new continent: Zeah, significantly expanding the map. Bridges and Ogilvie acknowledge, however, that most of the players who care about new stories get their fix with RuneScape 3, where the majority of new narrative content gets added. Watching the history of the world develop over time is a bonus, but a lot of what the team does is add more PvE challenges and skill updates. That doesn’t mean players are nudged in any specific directions, though. Old School RuneScape is a freewheeling sandbox, giving it a broad appeal that persists despite its age. He remembers one player, in RuneScape’s early days, who did nothing but chop down trees. “This player had a massive woodcutting level, but absolutely no stats in anything else.” They didn’t even use the wood, dropping it on the ground instead. For them, it was something to do while they chatted to their friends. RuneScape was this player’s IM of choice in the early 2000s. They’d been playing for nine months.